Champlain College, Middlebury and Saint Michael’s College, the Green Mountain Higher Education Consortium (GMHEC) founding members, are in the process of implementing new technology to support our strategic plans and better serve our institutions. We have given this initiative a name, “Project Ensemble” to represent our collaboration, innovation and success as we partner together for this important strategic initiative. The selection of this new technology followed an extensive evaluation process, which started in 2016, in which more than 250 employees across all three colleges participated through surveys, listening and requirements gathering sessions as well as product demonstrations. Why is new technology needed? Each college implemented its current Enterprise Resource Planning (ERP) systems over 10 years ago. Today, we know these systems as Banner at Middlebury and Colleague at Champlain and Saint Michael’s Colleges. Each college knew that it needed to replace this technology in the next few years: Processes have changed. Requirements have increased. People have changed. And so has the world of technology. The colleges needed to get into modern day technology. Think of how you navigate personal purchasing. Drop down menus, simple clicks, visually easy. Elimination of duplicate data entry. Elimination of shadow systems. Upgrades done in a few hours without the world shutting down. Click here for scope of project. Why would 3 colleges do this together? This, in many ways, is the foundation of the GMHEC mission. The consortium seeks to find ways in which we can partner together for the betterment of our institutions. There is a recognition that each school has their own mission and uniqueness, centered around student success. As Vermont private colleges, within a short geographic distance from each other, we already share and collaborate in many areas. And, we all have operational areas which are required to support our institutions. Each college independently evaluated options of implementing the technology on its own or together with one or more of the other schools. This was a thoughtful, focused effort and the benefits of implementing and sharing technology outweighed implementing independent of each other. These benefits included time to implement, leveraging cloud technology, sharing and learning of non-competitive best practices, costs, and on-going technology infrastructure, just to name a few. We know this model is unique. We know that it is challenging. And we know we have the right people to make this happen. Extensive financial and technology strategy analysis was conducted by each college independently and by GMHEC. We looked at options of each college purchasing and implementing technology on their own or together. Hands down, the financials indicated that implementing together benefited each institution significantly and the return on investment (ROI) was much shorter, together. Blackbaud RE NXT has been chosen as the information system for Advancement. Using cloud technology, Blackbaud offers a complete suite of fundraising solutions to over 2,500 higher education institutions. Implementation of this technology began in January 2018. Those deeply involved with this project include our advancement, information technology, academic operations, career services, and finance teams. Once implemented, users of our current Advancement systems (Colleague, Salesforce and Banner) will instead utilize Blackbaud. Oracle Fusion Cloud has been chosen as the information system for human resources, finance and potentially student (recruiting, admissions, registrar’s office, financial aid and student accounts). Oracle currently has more than 350 higher education customers in the cloud, supporting over 11 million students. The Oracle finance implementation began in April. Human resources began in May. Those deeply involved with this project will include human resources, information technology, academic operations, student accounts and finance teams. Oracle is actively working on a platform for Student systems and has a solid roadmap. GMHEC has been given a seat on the Oracle Student Design Council, which is focused on providing direction and feedback for this roadmap. We are monitoring progress on the roadmap and will intermittently have demos for the Student groups when appropriate. Advancement/Blackbaud implementation began January 2018. The system will go live February to March 2019. Finance/Oracle implementation began April 2018. The system will go live early March 2019. Human Resources/Oracle implementation began May 2018. The system is expected to go live in the fall of 2019. Student/Oracle purchase decision is expected during the 2020/21 academic year. 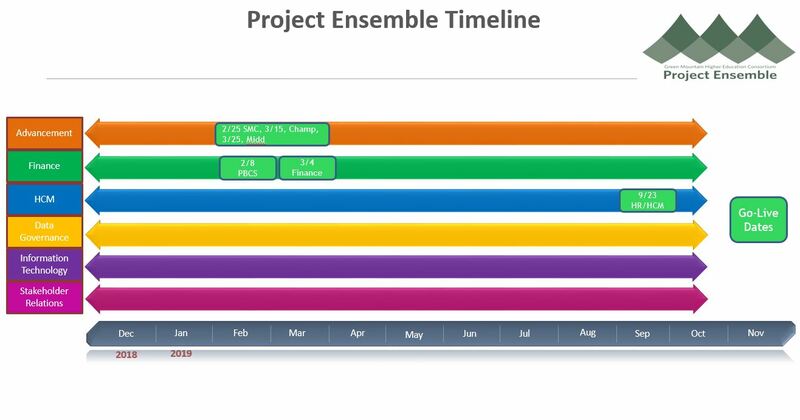 See the updated Project Implementation Timeline. “Go live?” What does that mean? Our colleges will be on new technology and a significant transformation will have occurred and will continue to occur. Previous systems will be fully eliminated and/or the reliance on them for certain institutional functions will have been reduced. We will be integrating data back and forth between old and new systems to best manage our operations. While many people have been and will continue to be involved, during the summer of 2017, we formed a Project Ensemble Governance Structure which is made up of senior leadership and functional experts representing all three institutions. We have created strong teams for these projects based on experience and capabilities. We have selected outside partners for implementation and project management. I don’t work in HR, Finance, Advancement or Student Systems. What are some examples of how this could impact me? Expense Reporting after travelling – No more Excel sheets. No more printing of paper. You will be able to use mobile technology to submit for reimbursement of your travel expenses. Timekeeping – All timekeeping will be done in Oracle. Simple, easy to use. Personal change of address, W-2, benefits – You will personally make these changes directly in Oracle. I work in HR, Finance, Advancement or Student Systems. How does this impact me? Many, many, many of you are already involved. You have helped select our Finance, HCM and Advancement Technology. You have provided significant input during the Process Re-Imagine and Re-Design workshops so that we enter our technology projects with new best practice processes. Thank you for all that you have already done! You will be working in modern technology with redesigned business processes. Many of you will be learning new technology skills during and after the implementation. Upgrades occur without much fanfare and your processes will remain current. Reporting and data access becomes much easier. Think of ordering a pair of black, size 7, pointy shoes from Zappos. Click, Click, Click. How do I keep up to date on this project? Look for updates in the GMHEC newsletter called “The Connection” which will be released monthly. You can also subscribe to the GMHEC webpage/portal. Watch for open sessions at your college. Check out the GMHEC website. Reach out to anyone in the Governance Structure. Questions or comments – let us know.